In Lakeland, Florida, three men Adam Young, Brett Broden, and Robert Schill broadcast their gameplay for thousands to see across the net. The stars of StreamerHouse, Twitch’s only 24/7 gaming channel, get paid to sit on their couch and play video games. All three men take turns broadcasting their game play by working in shifts, which allows viewers non-stop entertainment. They are also not limited to just one gaming console, which fans can see they intermittently change between Xbox and PlayStation. The entire house is equipped with 20 cameras, over 15 monitors, and countless microphones. Everyone in the household lends a helping hand in the production of the channel. Whether its maintenance to the equipment or general chores, everyone pulls their own weight. It gives viewers the ultimate interacting experience, so they are not only limited to just live game play. StreamerHouse caters to the newer generation of entertainment by having its stars interact and be more accessible to their fans. It gives viewers the ultimate experience, so they are not only limited to just live game footage. The concept is reality TV meets talk show radio. Viewers of the channel definitely enjoy the relationship the trio has built with them. Fans often send pizzas, t-shirts, candy, and occasionally money. Most of the trio’s income is made by a portion of Twitch advertising, game sales, fan donations, and subscriptions. 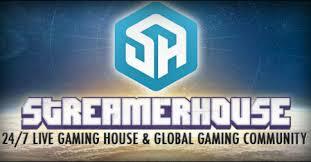 Young, Broden, and Schill admit to not having college degrees, but have seen much success through the StreamerHouse channel. While none have openly disclosed the exact dollar amount of their earnings, they are able to live comfortably enough to afford their monthly living expenses. Also they were able to purchase a new vehicle, which they allowed their fans to pick out the name of the license plate. It is difficult enough to find a job or career these days that one would genuinely enjoy. These three have been extremely fortunate enough to live out many of our childhood dreams. You can view their gameplay now on StreamerHouse.